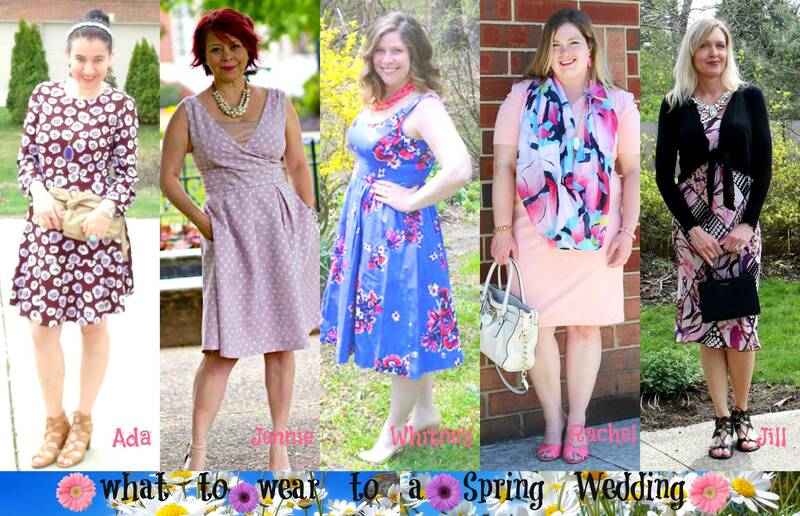 What to Wear to a Spring Wedding - Bloggers' Collaboration. Happy May everyone and welcome to my favorite month. So happy to be starting off this week (which is both my birthday and my husband's birthday week, too) and a new month with another Wedding Post today, with the ladies of the "What to Wear to a Wedding" brigade: Jill, Whitney, Jennie and Rachel. Each of them run successful linkups each week also, so make sure to join Jill's on Thursdays, Whitney's on Mondays (today) Jennie's on Fridays and Rachel on Tuesday's (tomorrow). Today we are back with our own take on what to wear to a Spring Wedding or how to style a Spring Wedding Look. Clearly, almost all of us had florals and fun colors in mind. Jill and I are even wearing similar laceup sandals. Everyone looks fantastic and I love and want that cobalt floral dress of Whitney's but Jennie's outfit is most definitely my favorite. That dress is stunning: 50s silhouete, polka dots, Rose Quartz, texture, pockets and she accessorizes with classic bold pearls. For more wedding inspiration no matter what season, check out our previous wedding collaborations here, plus here and here. Last weekend I attended an old co-worker's wedding. Myself and another former co-worker went together. My friend styled this gorgeous floral maxi by the way. 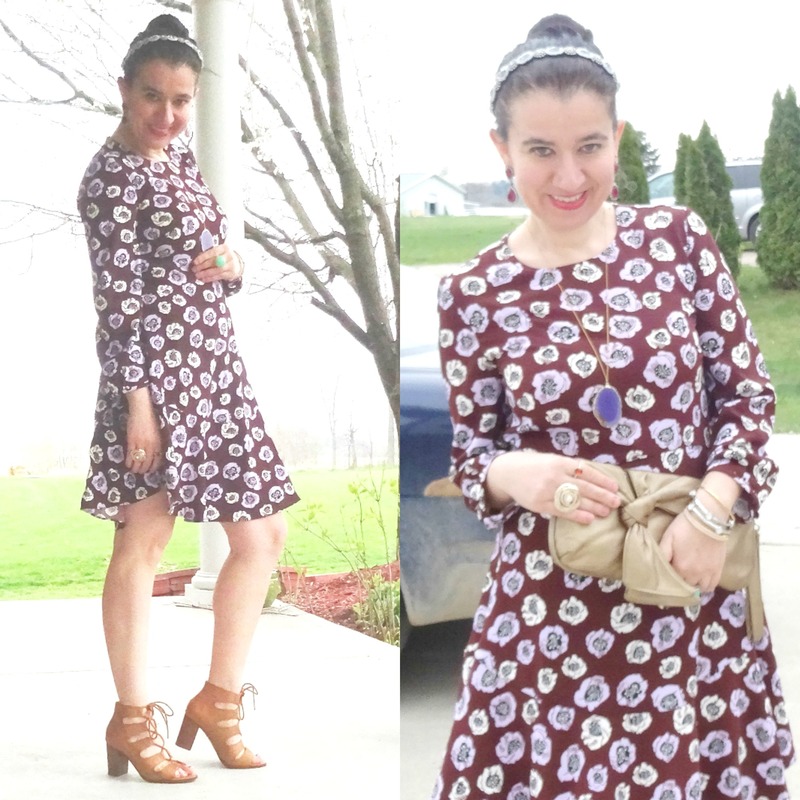 Knowing that the wedding was fairly small (90 guests) and in a more casual, relaxed and a little bohemian atmosphere, and also knowing what my friend would wear, I decided to go for my Ann Taylor Loft Poppy Maroon Dress (I was lucky to score for about 60% off the regular price, a few weeks ago). I will be honest with you, this is the most casual Wedding Outfit I have ever worn, but again it worked for this particular wedding, for the venue and for the event. The bride wore a hi-lo ivory gown with ivory espadrille wedges, flowy wavy hair and a flower crown made with real daisies, in case you were wondering. She looked like she stepped out of a magazine. 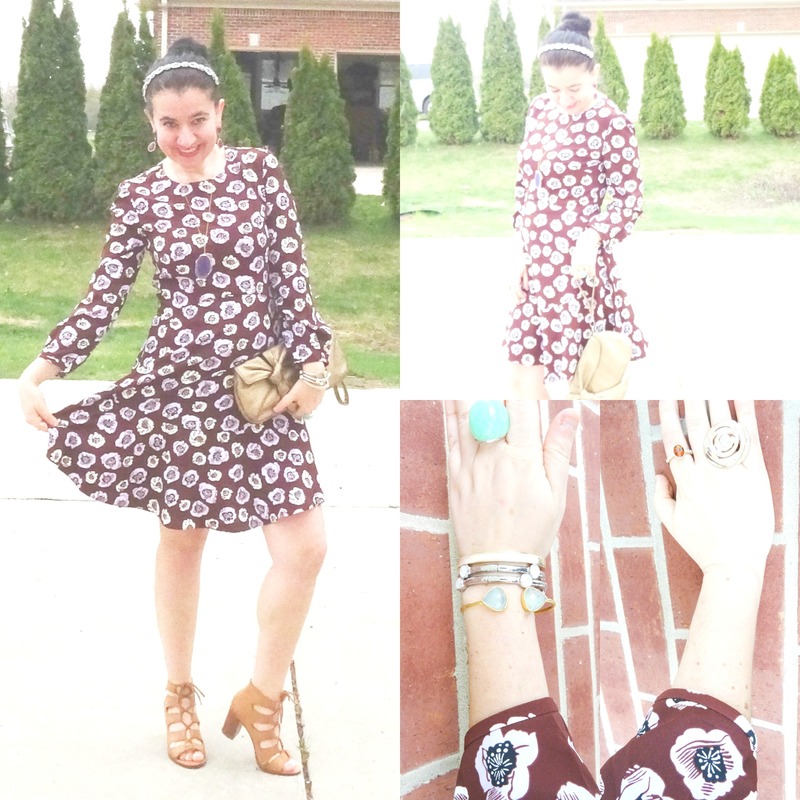 I decided to go for this fit+flare beauty and bring out the bohemian girly side of me. 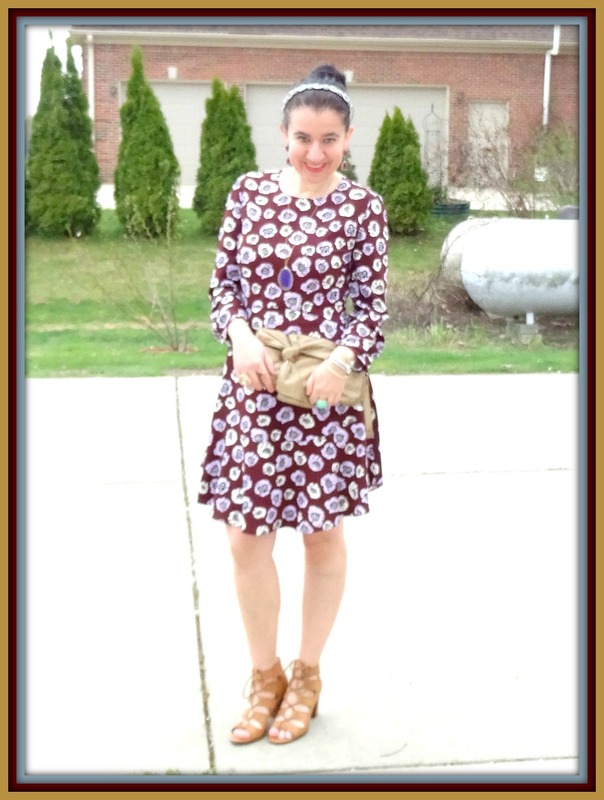 I styled it with my new Camel Lace-up Block Heel Sandals. 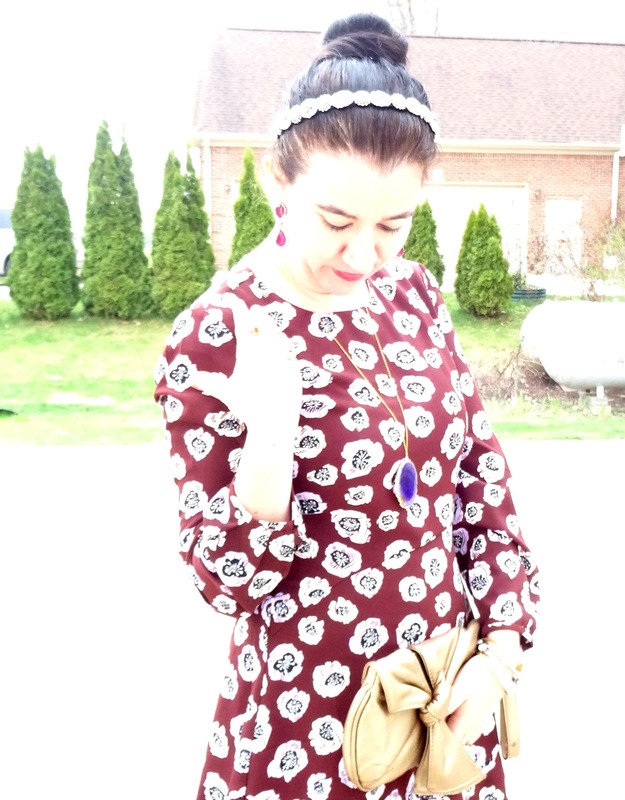 I decided to add a Crystal Headband to my hair which was already pulled back into a sock bun. 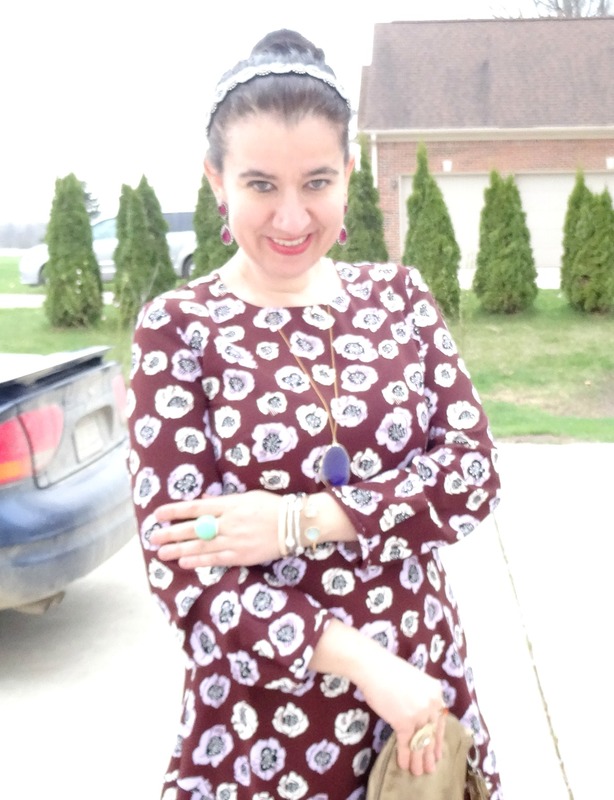 For the jewelry, the entire latest set I received on my Rocksbox worked out perfectly: the Purple Agate Pendant, Aqua Cuff and Merlot/Fuchsia Statement Crystal Earrings. I did mix in some other bracelets and added a couple of Fun Cocktail Rings, though. 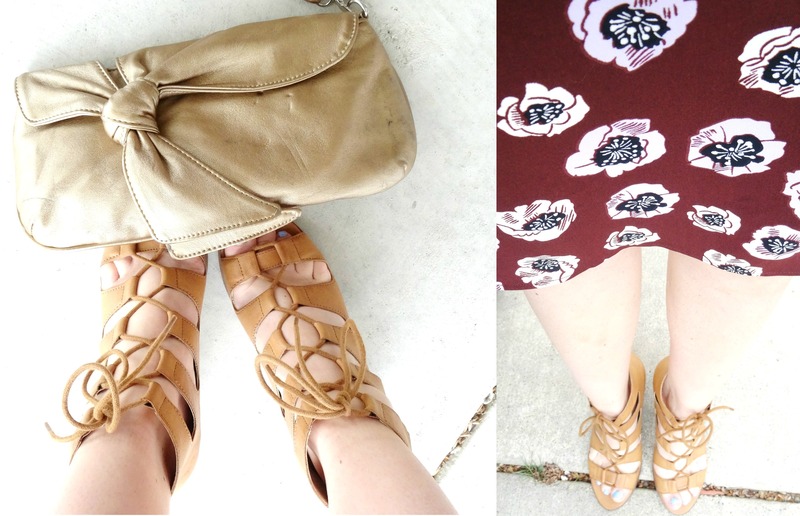 And my Gold Bow Clutch meshed well with the Neutral Shoes. I am very 'less is more' when it comes to makeup so all I have on is fuchsia lipstick, some blush, mascara and a kohl eyeliner. What do you think? Yay or Nay for a Spring Wedding or is it too casual? Gold Soft Leather Wristlet Clutch w/ Knotted Asymmetric Oversized Bow: Nine West (very similar), (fun metallic mesh option, Steal, love this), (similar, Splurge). 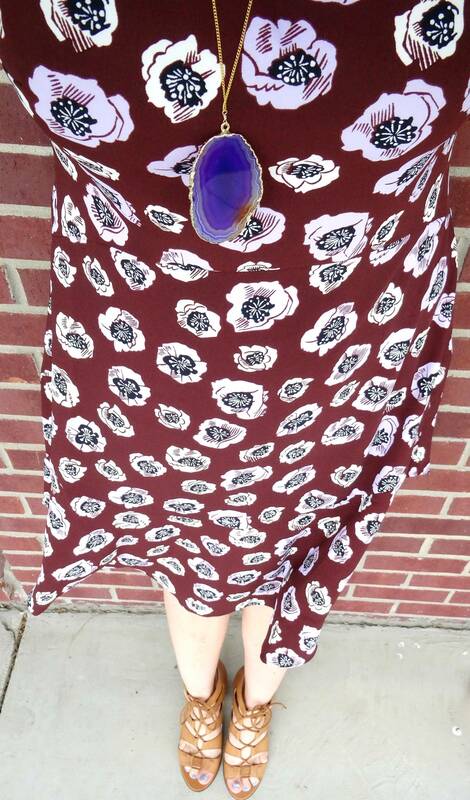 Maroon/Wine 3/4 Sleeve Fit+Flare Short Dress w/ Lavender Poppies: Loft (New) (very similar, Splurge), (similar casual, mini option, Steal), (similar w/ laceup detail, Great Deal, love this), (modern flowey option, love this). Stretchy Bohemian Headband w/ Oval-Shaped Crystal and Neutral Beaded pieces: Wal Mart (very similar, Steal), (similar, on Sale), (similar, Splurge). 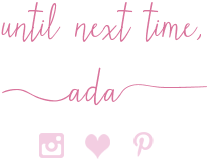 This will be a very fun celebratory week on the blog so stop by every day for fun outfits, gorgeous shoes and lots of fantastic guest bloggers. Thank you for reading today. Happy Monday and Happy May! 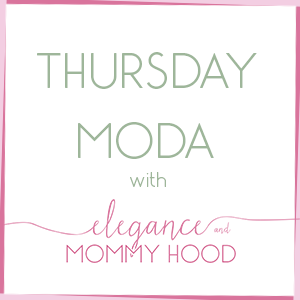 Also linking with the ladies of "Ageless Style" a new monthly linkup that starts tomorrow and it is on the first Tuesday of each month. This month's theme is Floral. This linkup is run by several of my blogging friends like Alice, Carrie, Debbie, Jennie, Nicole and Shelley.